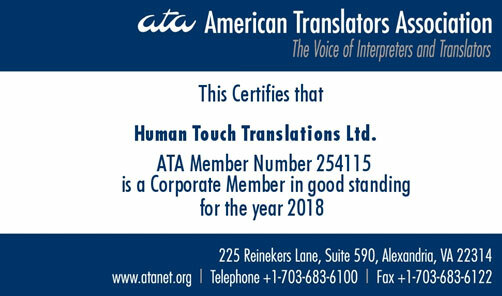 At Human Touch Translations we maintain a highly secure chain of custody so that all information is both protected and readily available only to those with adequate access rights. An encrypted cloud-based storage setting lies within a highly secure Virtual Private Network, the IT backbone of our core business. Each project entails a comprehensive workflow process involving a selection of specialized translators, editors, transcreation specialists, interpreters, and other language professionals. Project workflows are closely monitored by dedicated project managers in accordance with our International Organization of Standardization (ISO) certified processes and guidelines to provide world-class language services. Our Vendor Manager carefully selects linguists complying with our ISO quality standards. All are handpicked by the Project Managers for each specific project based on their background and expertise. Each PM works around the clock to ensure all resources and materials are available to each linguist in a timely manner. Client documents are managed securely and shared with the linguists in a confidential and self-contained environment. The translated files are then delivered in the agreed upon format and timeframe. Our professional interpreters are well-prepared and arrive ahead of schedule to meet with the client before the meeting commences. Last but not least, ALL linguists are all bound by our confidentiality agreement.